With ImageSim Training, medical trainees will be able to practice interpreting up to several hundred examples of image-based cases. This learning system emphasizes the learning paradigms of deliberate practice and assessment for learning. 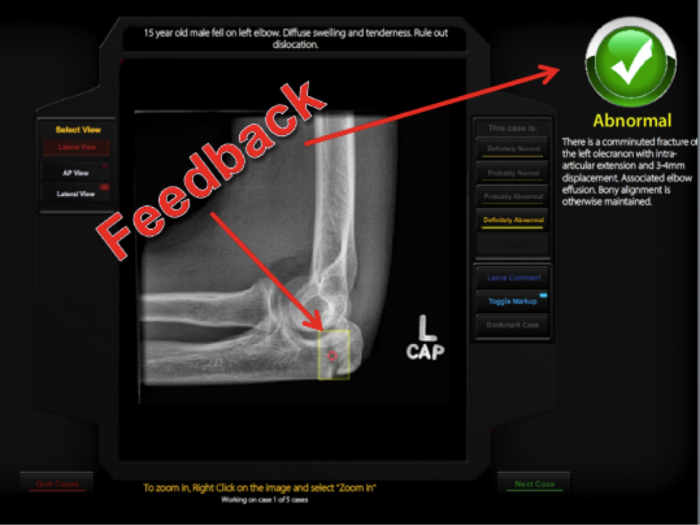 As such, after a trainee submits their diagnostic impression, the trainee receives feedback with every case and learns more effectively from every case they do. These educational strategies have also been shown to improve learning retention. The trainee gets reports on the number of modules started, number of cases completed, and performance measured as accuracy, sensitivity and specificity. In line with current resident evaluation trends, ImageSim learning system implements a performance-based, not time-based, competency threshold. To be considered “practice-ready” competent, a trainee must achieve scores of at least 80% in accuracy, specificity and sensitivity. *Our results to date show an average increase in accuracy of 15% after about 100 cases. We are currently trusted by over 20 post-graduate training programs internationally. See course demos here. Access to all cases is for two years and trainees are permitted access to cases more than once to achieve competency. Contact us to discuss trainee pricing and group rates for your program.